This finger is from the remains of a special effects hand that was shot off the arm of Davros in the Doctor Who story "Revelation of the Daleks" starring Colin Baker as the Doctor and Nicola Bryant as Peri. This 22nd season, two part serial (6z) was first transmitted on 3/23/85. 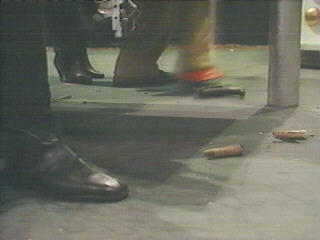 One of two known remaining digits from the evil hand of Davros that were blasted off as part of the climactic scenes. The special effects hand was made of expanded foam and latex filled with a smidge of explosive to complete the effect. A well placed camera angle, quick editing and a bit of post processing to add the laser beam and you have a respectable bit of action. The following shot shows the now detached fingers on the floor just to add some drama. 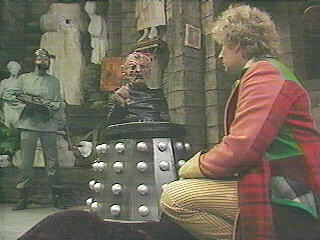 The Doctor tries to distract Davros while plans are made to end his evil plot. Unfortunately things don't go very well and all that is accomplished is that Davros looses his only good hand. Mick Hall of Luton obtained the finger from Barry Smith in 1984. Barry worked for Imagineering at the time and was very friendly with Richard Gregory. Because the finger was so fragile Mick dipped it in resin to preserve it. Mick kept the finger until around 1992. He isn't sure when it left his collection or whom he passed it on to. The next known owner of the finger was Dave Willcox of Bristol, who could have gotten it from Mick but this has not been confirmed. Dave auctioned off the digit on eBay in November of 2000 where John Marshall of Philadelphia was the victor. I bought the finger from John in November 2004 where it now resides in my Virginia collection. The display is made from a 6"X6"X6" commercially made acrylic display case. A backdrop was added sporting the traditional Tardis roundels. The descriptive placards and label were created using Micorgraphics Picture Publisher and mounted on foam core board where it sits on the bottom of the case.